Harrison Street Real Estate Capital, one of the largest owners of student housing in the US and Europe, and Uliving, the student accommodation developer and operator, have signed a partnership agreement to invest in purpose-built student accommodation properties in the UK and have finalised agreements on their first project, a new £40 million (GDV) student accommodation development in Birmingham’s city centre. The development will be Uliving’s first off-campus, direct-let project. UBS Asset Management is providing senior debt funding through its real estate debt fund, the UBS Participating Real Estate Mortgage Fund (UBS-PREMF), while Harrison Street is the majority equity investor. Uliving, the dedicated student accommodation brand of property development company Linkcity, is also providing equity and is the developer and operator. Uliving’s partners Bouygues Energies & Services and Bouygues UK will provide facilities management and construction services. This high-quality student accommodation development will be built on the site of Bath Court on Bath Row, ideally located for students studying at University College Birmingham, Birmingham City University and University of Birmingham campuses. 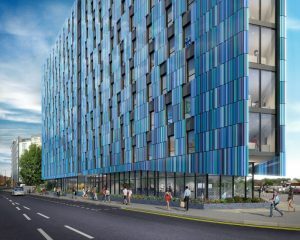 It will include 435 new student bedrooms and extensive facilities including a large, street-facing gym; an open-plan common room area with seating, games and television screens; two study rooms; a launderette; a dance studio; and a landscaped roof terrace. Eastdil Secured acted as financial adviser and Trowers & Hamlins was legal adviser to the Joint Venture. DLA Piper was legal adviser to Harrison Street Real Estate Capital and CMS Cameron McKenna Nabarro Olswang was legal adviser to UBS Asset Management.